The idea for this annual event began when Sabrina Epstein and Carly Morgan, two Bullis students and members of the Bullis KEEN Club, enjoyed a great night at KEENFest with their buddies. The girls and their athletes had so much fun, they thought every KEEN athlete deserved to get dressed up, go dancing and have their own prom experience. Thus began the KEEN Bullis Prom! 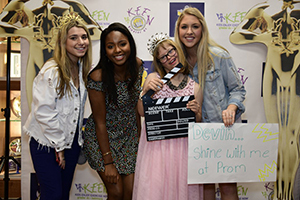 The students brought their idea to the Bullis community and the first KEEN Prom hosted by Bullis was held in May 2016. This annual event, pairs teen-aged KEEN athletes with Bullis prom buddies for a one of kind, fantastic, prom experience. Check out the amazing photos from past proms! To read an article in the Potomac Almanac about the first prom, click here.